Space shuttle Atlantis nears Launch Pad 39A on March 31, 20009 in preparation for the STS-125 mission to service the Hubble Space Telescope. Launch is set for May 12. 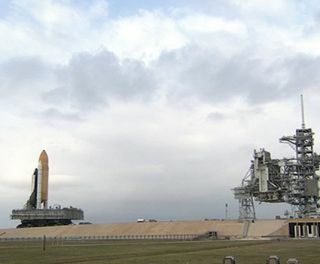 The spaceshuttle Atlantis moved out to its seaside launch pad in Florida early Tuesdayto prepare for NASA?s long-delayed final flight to the iconic Hubble SpaceTelescope. Movingslowly atop an Apollo-era carrier vehicle, Atlantis began the 3.4-mile (5.4-km)trip to Pad 39A at NASA?s Kennedy Space Center at 3:54 a.m. EDT (0754 GMT) and reachedthe launch site about seven hours later. WithAtlantis at the launch pad, NASA will once more prepare the spacecraft for aMay 12 launch to the Hubble Space Telescope. Five back-to-back spacewalks areplanned during the 11-day mission to upgradethe orbital observatory and extend its life through at least 2013. The missionhas been delayedsince last fall, when a data handling unit aboard Hubble unexpectedlyfailed just weeks before Atlantis was due to launch toward the spaceobservatory. NASAengineers revivedHubble from the failure and began preparing a spare to launch aboardAtlantis and be added its overhaul mission. The sparedata handling unit arrived at the Kennedy Space Center on Monday, NASAspokesperson Allard Beutel told SPACE.com from the Cape Canaveral, Fla.,spaceport. Commandedby veteran spaceflyer Scott Altman, Atlantis?s STS-125mission to Hubble will send seven astronauts on the fifth and final servicecall to the orbiting laboratory. Theastronauts are expected to add a new camera, replace gyroscopes and batteries, aswell attempt to repair equipment that was never designed to be fixed in space.They also plan to attach a docking ring to the telescope so a robotic vehiclecould visit it in the future. Beutel toldSPACE.com that aside from a minor ding to one of the heat-resistant tiles on Atlantis that required repair, the shuttle?s preparations for launchhave gone smoothly. Last week,a shuttle worker accidentally dropped a torque wrench socket while tighteningbolts on the bipod strut that connects the shuttle's nose with its 15-storyexternal fuel tank. The socket bounced off a beam and dinged a tile near thefuel inlets on the belly of Atlantis. ?It was somethingthat was very repairable,? Beutel said. Engineers filed the small ding with heat-resistant putty and molded it to fitthe shuttle?s aerodynamic lines, he added. Efforts toprepare a second shuttle, the Endeavour orbiter, to serve as a rescue ship forthe Atlantis astronauts are also going well, Beutel said. BecauseHubble orbits the Earth higher and in a different inclination than theInternational Space Station, Atlantis would not be able to ferry its crew tothe orbiting laboratory to seek refuge should the shuttle suffer critical damage.Instead, NASA is preparing Endeavour and a skeleton crew to be ready to liftoff from a second launch pad to retrieve the Atlantis astronauts if needed. Beutel saidthat Endeavour is on track to leave its hangar and move into NASA?s cavernousVehicle Assembly Building on April 10. The shuttle is then expected head out tothe seaside Pad 39B launch site on April 17.